Discussion in 'Downhill & Freeride' started by oly, Sep 29, 2005. Well, I like the way the rear swing arm brace doubles as a chain guide/tire protector. Does anyone else think that "traditional" top tubes belong only on road and XC racing bike? I'm so used to seeing the smarter/functional low-slung & braced style that that bike just doesn't look right. Nut cruncher. That bike with top tube/seat tube design of the F1 would be interesting. They'll do custom work, right? is there another link underneath the bash gaurd? is it going to have a rearward axle path like the f1? if it does, i'm in. notice the front derailleur (sp? ), could this be a trail bike? yes. something like 6" travel. thus the taller stature. what tires are those? high rollers? they dont really look like it to me. My guess is they are those new maxxis trail bike tires that I've heard about. That is pretty sweet except the top tube is rather odd looking(too strait) as someone else mentioned, I need more info! It is a pretty sweet bike. 6" travel trail monster. Really nice geometry - it is going to fly down the hill. The frame is 4130 CroMo. The tires are Maxxis Swamp Things. I only got to sit on it at the show but it is on my short list for sure. I was lucky enough to ride a prototype of this frame. Here's what I know; 5" or 6" of travel, parallel linkage, rearward path, but not nearly as much as the F1 so that the upper pulley is not needed. Frame is going to retail for$1799 USD. DH geometry, chromoly front triangle, aluminum rear, adjustible drop outs, fits an 8" rotor. The one I rode was set in the 5" mode, had a White Brothers fork and a Mavic 3.1 wheelset, but a MRP Bones Combo crank (4lbs). It was a small frame and the whole package weighed in around 34lbs. Intent isn't really for trailbike use, more resort riding and the such. I found that the more I played on it, the more I started thinking I'd ride this more than my big bike! How long is the wait for an F1 or a Fatty Fat? I want to get one of the two next year. Anyone know if this is possible? Hmmm... sounds like I may want to call them and put a deposit down now. What's it like dealing with them? Are they pretty on top of things or are they lagging slackers? Do you know... is the Fatty Fat a production model or would that be a custom order? I really like the look of the bike. I need to find someone in SoCal willing to let me test ride it. 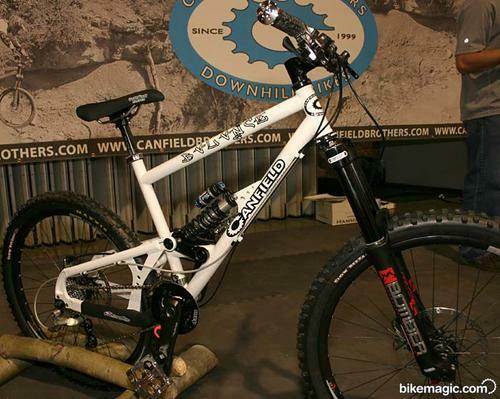 Thanks a ton for the info, I am buying a new DH bike next year and the Canfield looks like it might be it. The new chromoly Formula 1 is supposed to be out the first of the year. The Fatty Fat is part of their custom line. You'll have to contact them to find out if you can get one. From what I understand, they aren't really doing them anymore as other models have better features. I'd get your order in for the Formula 1 though. From what I understand they have had really good response from Interbike, and are adjusting their production run as we speak (or post!) based on pre-season orders. I had the same experience. GREAT guys. "iridebikes" on this forum is Lance - they seemed to reply to my emails quite promptly. ehh doesnt look like it could be pedaled around to easily, I would deffinately go for my F1 over it for DH. anybody have any new info on this thread regarding the balance? i missed this thread when it started, but caught info about this bike on nsmb.com today. I Tried To Get A Custom Canfield Bros. 3 Year Wait, So I Wound Up With A Brooklyn. Oh Darn! that sux. however, is that the case with a custom bike order, or with all bike orders? Production is sheduled to be out at the begining of the year. The F1 and the Balance will be available then. For a custom you would wait a long time but truthfully with the production bikes you get everything you would get with a custom, just a far better price. The Balance is a 4130 front with a 7005 rear and links, 20mm pivots built like a DH bike, full length seat tube, front derailliur compatable, adjustable chain stay from 16.125 to 16.75.
any word on sizes available and other geometry numbers? i emailed the info address on the website, but have not received a response yet. I think I just found my new bike. What size is that pictured there? What's the projected frame weight? You can tell MTBR is broken 'cause I'm posting here. this is her in all her glory! It is a small top tube but the seat tube is a medium size. We will have a sizing chart up at www.canfieldbrothers.com in a week or so. The frame weight is 10.25 lbs with shock. As for the Fatty Fat frames we aren't building them any more but I have a line on two used ones if anyone is interested. PM me about it. Fattyfat1 - I'm so happy to hear you're still ripping it up on your Red Fatty! What's it been? Three years? Ok, the end of Feb is here, and these things are supposedly out and about. Who has one? I want a report. BTW, what is the rear hub sizing on this beast 135/10mm standard, or something bigger? Talked to Chris last week the F1's and balances had just got to Utah and Lance was going to start getting the ALM Luckies started. So if you want one call them.